Our second winery during our Temecula visit was Palumbo Family Vineyards and Winery. We met with Nick Palumbo, owner, and winemaker. He purchased the property with an existing vineyard in 1998 and started making wine two years later. 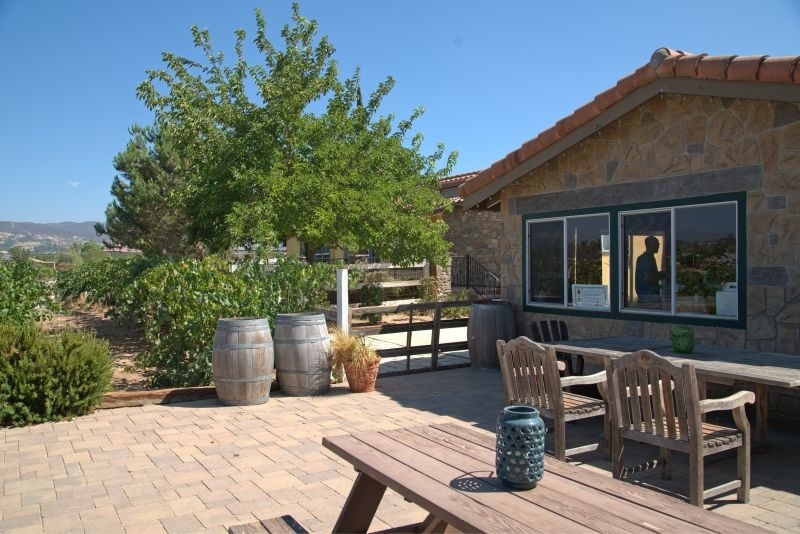 In 2002 the winery became a full-time business; at that time there were fourteen wineries in Temecula. Nick said: “I would like to say I was smart (with the timing), but it was dumb luck”. He went on to explain that they have kept it small and focused on quality. This is reflected in the small and unpretentious tasting room, which has a bar with room for six people to stand. 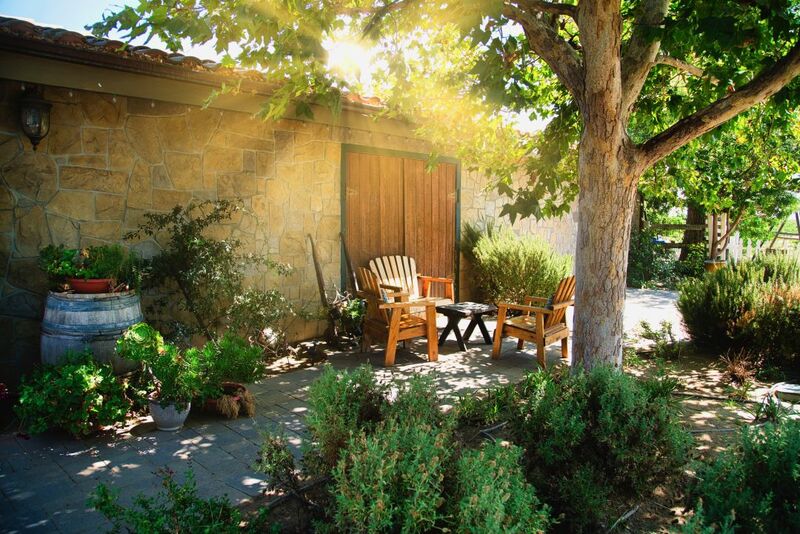 There is a handful of well-weathered tables and chairs on the terrace outside the tasting room. Amber comments: One of the things that struck me about Nick Palumbo is his background as a chef and how it relates to him as a winemaker. I could taste how the wines are made to pair effortlessly with food. Coming from a foodies perspective, that is a very powerful thing. Usually, winemakers come at the issue from the opposite way in that they make their wines and then food gets paired around the flavors they achieve. Nick Palumbo pouring his Rossato Seco for us. What a wonderful glass of wine! 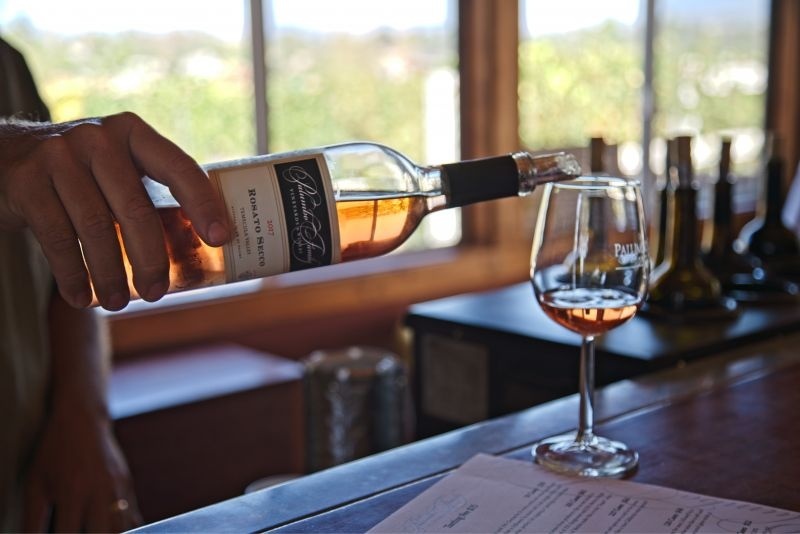 The first wine we tried was the 2017 Rosato Seco ($28); a saignée rosé made of Mourvedre (65%) and Grenache (35%). The nose was low intensity with aromas of grapefruit. The colour was a golden peach. Taking a sip I was struck by a bright wine with a soft mouthfeel and flavours of strawberry, lemon, pepper, and a hint of honey. It was, for a rosé, surprisingly complex. Palumbo built their reputation on red wines. They do make one white; a Grenache Blanc; which is sold out, so we were unable to try it. Amber comments: I loved the beautiful texture of this wine. It had character and spirit and I felt the glass begging me to take another sip. I rarely find that in rosé. Next up was the 2014 Due Rossi ($45). The wine is a blend of Sangiovese (75%) and Merlot (25%); inspired by a trip that Nick Palumbo took to Tuscany. The nose was intense with ripe strawberry, cherry, and cedar. On the palate, it offered bright acidity with cherry, raspberry, tobacco, and silky tannins. This was a good, well-balanced wine. Amber comments: This was my favorite sip of the day. I thought the idea of adding Merlot to the Sangiovese was a brilliant move on Nick’s part. They both have similar weight and structure but the Merlot gives an elegance and a bit of maturity to the bright and fruity Sangiovese. The second red of our session was the 2014 GSM ($46). It presented an intense, lightly spiced fruit-rich nose with cherry notes. It was an acid first wine, with a bright mouthfeel. Delightfully complex; the flavour profile included cherry, plum, raspberry, pepper, and cumin. This is an excellent wine and a fine example of a GSM. The blend is a 40/20/40 split between the three varieties. Amber comments: I thought this was a very fine version of a GSM. For a wine as young as it is, it was drinking beautifully. I would love to see what it does in another 3 years. Old Fashioned white gate leading to the family home and vineyards beyond. Next up was the 2013 Cellar Dweller “Jimbo Blend”. The blend is 47% Mourvedre, 28% Syrah, 25% Cinsault. It sells for $48. The nose was short on fruit, with leather, green pepper, and forest floor. The Rhône style wine was bright in the mouth and offered flavours of plum, raspberry, and pepper. Amber comments: I really enjoyed the depth and quality of this wine. I felt it would be fantastic with a meal of anything from old-fashioned meatloaf to a fancy short rib. Gorgeous tasting room with beautiful trees and landscaping. The perfect place to relax with a glass of wine. Our final taste was of the 2014 Meritage ($52). The blend was 40% Cabernet Sauvignon, 40% Merlot, and 20% Cabernet Franc. A rich nose infused with plum promised much. The wine delivered on that promise, with plum and raspberry balanced by acidity and medium tannins. The wine is drinkable right now but should improve with age. Amber comments: I thought that this wine was one I would cellar for at least another two years. It will come into its own then, smoothing out and relaxing to give you a lush and lingering sip. If you are drinking it now, decant it for at least two hours and let it open up. You will be happy you took that extra step with this beautiful wine. 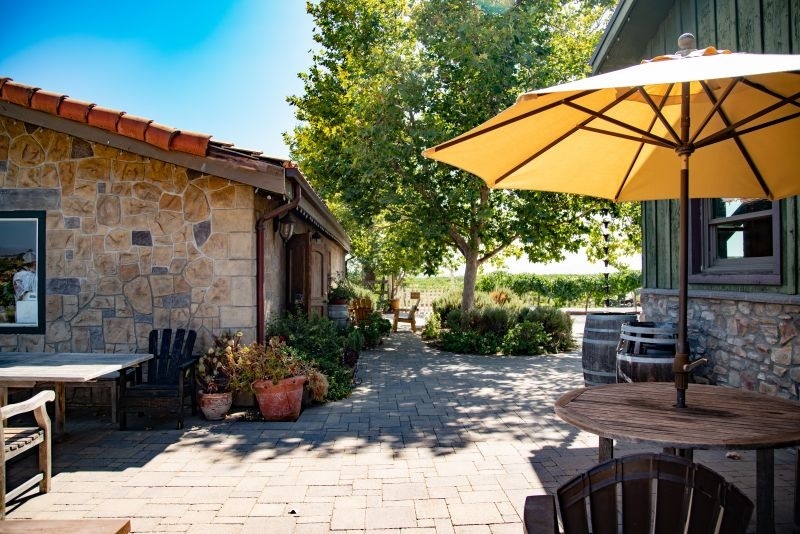 View of the back patio area at Palumbo tasting room. Our busy schedule meant that we did not have as much time at Palumbo as we would have liked. The wine was excellent and Nick was great company. 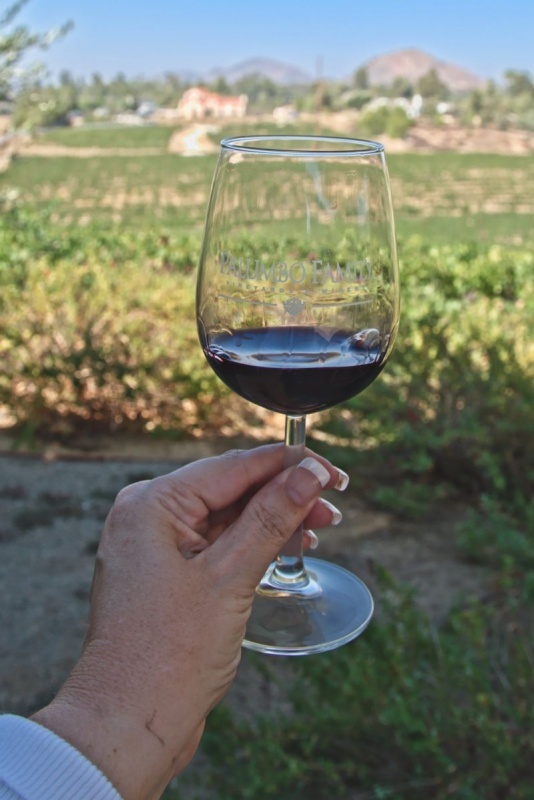 The tasting room is not an architectural marvel, nor is the view the finest in Temecula. This is the anthesis of the Temecula party reputation. However, if you like well-crafted wine, then we have no doubts about recommending Palumbo. I too enjoy the charm of a small tasting room and the ability to taste with the winemaker/owner is very special. The Palumbo GSM sounds delish! I’m glad to know the name. Thanks. Palumbo is kind of interesting in that the owner/winemaker would truly prefer not to have a tasting room at all. He doesn’t allow large parties to taste there – apparently, that is an unfortunate thing in Temecula that people rent limos and go in crowds. They aren’t there to really enjoy the wine, just to get drunk. The winemakers who are there truly working on their craft are very frustrated. Sounds like a really pleasant afternoon, sipping thoughtful wines in good company. I dig the low-key vibe of this place! We were so sad that our tasting was rushed there. The wines were fantastic… clearly quality juice being made there. We visited this winery 7 or 8 years ago and really enjoyed their food friendly wines. 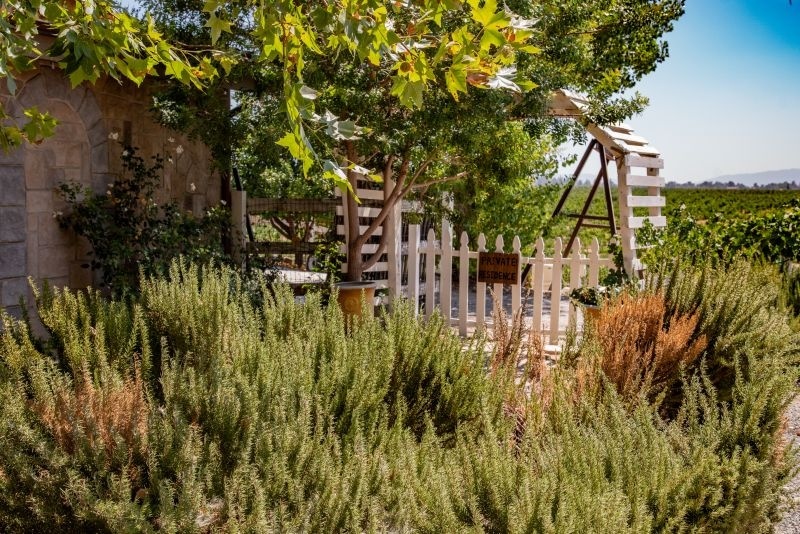 It is a charming location also with the beautiful view out the back over the vineyards and west to view the sunset from the patio. It’s charm is just increased by being off the beaten path. It is a place we should return to visit. I look forward to hearing about the other Temecula wineries you visited. It has been awhile since we have been that way! Thanks so much Robin for your comment. I did really enjoy this winery. We have several more articles coming up about this area.